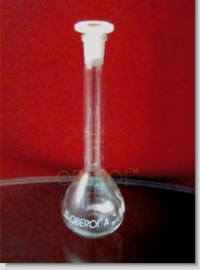 Volumetric Flask with one Graduation mark & Polythelene Stopper Class B IAW ISO 1042. 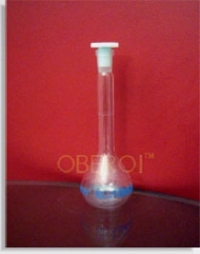 Volumetric Flask with one mark & Polythylene Stopper Class A IAW ISO 1042 supplied with LOT Certificate. Volumetric Flask with one mark & Polythelene Stopper Class A IAW ISO 1042. Supplied with Serial Numbered Individual Work Certificate. Volumetric Flask with one mark & Polythelene Stopper Class A IAW ASTM E 228, specification & USP standards. Supplied with Serial numbered Individual work Certificate. © Oberoi Scientific Corporation, India.